Decades of conflict have caused serious and widespread land and resource degradation. This has been driven by unsustainable management practices and is now being exacerbated further by climate change. 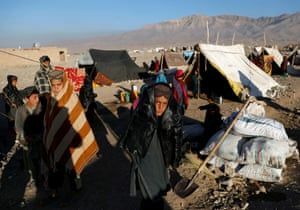 Afghanistan faces a range of issues including remnants of war, water and resource conflicts and corruption, while long-term efforts to rebuild environmental governance and address degradation are being hampered by its ongoing insecurity. A brief introductory overview of the environmental dimensions of the conflict in Afghanistan, with facts, figures and further reading. Pollution is killing more people in Afghanistan each year than armed violence. While efforts have been made to build environmental governance since 2003, addressing the health and environmental threats posed by pollution in the face of insecurity, high levels of corruption and with limited financial resources remains an enormous challenge. NATO’s presence in Afghanistan included 1200 properties, from major airbases to small forward operating bases. Environmental oversight was mixed and the Afghan national authorities had limited capacity for investigating contamination or other forms of damage. Furthermore, the bilateral agreements between Afghanistan and major NATO contributing nations provided very limited scope for environmental redress. The conflict in #Afghanistan has caused & led to serious environmental harm. The government has green policies but its money is focused on fighting the Taliban, who are positive about environmental protection. Can the environment help end the conflict? The response to the drought in #Afghanistan has been too slow but even when it wanes, land degradation and the overuse of resources that have been driven by its conflict will mean that vulnerability will persist, with the added pressure of climate change. Afghanistan’s economy and people are heavily reliant on agriculture, a sector that has been under huge pressure due to conflict and insecurity and increasingly to climate change. This report from the UN FAO provides insights into the linkages between these factors and the efforts to address them. Water security is a growing problem in Afghanistan, and one that looks likely to worsen with the impact of climate change. Access to clean water is already limited and aquifers and rivers badly affected by pollution. Lasting development of Afghanistan’s mining sector can only be possible if local and foreign actors achieve a certain level of stability and can establish inclusive governance structures in some parts of Afghanistan. Islamic State is chopping down fruit trees and smuggling the timber into Pakistan, claim Afghan officials and local residents of the Deh Bala district of eastern Nangarhar province where the terrorist group operates. While much has been written about the United States’ security and geopolitical motivations for the War in Afghanistan, relatively little literature exists on the conflict’s mineral factor, this analysis identified how the past three administrations shaped their policy directives around Afghanistan’s mineral deposits. Climate change and water stress are posing a serious challenge to Afghanistan’s farmers. This briefing examined a range of toxic remnants of war that could impact installations in Afghanistan as a result of the drawdown. It also considered current agreements in respect to environmental liability, identifying a policy gap that could unjustly impact Afghan citizens. This report looked at the ways in which natural resource management—the institutions, policies and practices that govern land, water, forests, minerals, hydrocarbons—interact with violent conflict in Afghanistan. Provides an overview of the context, importance and use of natural resources, their conditions, trends and linkages to regional or global factors. The report also reveals how Afghanistan’s natural resources – if sustainably managed – could provide the basis for future economic growth and stability. UNEP’s post-conflict environmental assessment illuminates Afghanistan’s current levels of degradation, and sets forth a path that the country can take towards sustainable development.